Most Ocracokers, young & old, enjoy Halloween. 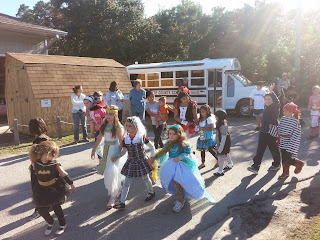 On the Friday before the holiday Ocracoke school sponsors a community carnival and costume parade. On October 31, beginning in late afternoon, island children descend on Lighthouse Road for trick or treating...and braving a haunted tunnel or other scary scene (if they dare). Hardly anyone ventures down Howard Street. I guess the real graveyards, dark shadows, and stories of long dead sailors & pirates make the sandy lane too eerie. There are always various adult Halloween parties at local nightspots, as well. If you are on the island come join in the fun. Just be responsible...and don't drink and drive. I was looking through some of my file folders a few days ago, and came across this photo that was given to me by Judy Jones who has an historic connection to Ocracoke. This photo of the future NC Highway 12 was taken in 1956 at the edge of the harbor (you can see two children wading in the water on the right), about where the Fish House is located today. If you enlarge the photo (use the guidelines to the right) you can also see the peak of the center section of the Island Inn in the background, just to the left of the vehicle. The following photo was taken from about the same vantage point as for the 1956 picture. I had to stand on the property of the Fish House because the vehicle tracks in 1956 were closer to the water than the paved road is today. Needless to say, the Island Inn is no longer visible from this position. Ocracoke is still a wonderful place to live...but quite different from the village I knew as a child. Today Portsmouth village is a ghost town. Many residents who had relied on commercial ship traffic through Ocracoke Inlet (islanders had been pilots and lighterers, those who transferred cargo from larger ships to lighter, shallow draft vessels) moved north when Hatteras Inlet opened in 1846. When federal troops invaded the Outer Banks in 1861 most remaining Portsmouth Island residents left, many never to return. "...Miss Rossie Gaskins...had to remain on the island when others fled to escape the Yankees. She had grown so fat that in the panic of vacating her home, she wedged herself in the front door and could not get out. It is said that the soldiers found her there, helped to free her and allowed her to re-enter the house by the back door which was wider. When her friends returned, she reported that she had been treated well by the Federals." Writing in the November, 2013 issue of Harper's Magazine, Bee Wilson ("At Death's Door, the Hope and Hokum of Immortality") observes that "In 1840, the longest-lived women in the world were in Sweden; their average age at death was forty-five. As of 2009, Swedish women can expect to live eighty-three years." This reminded me of one of the most remarkable Ocracoke tombstones in the George Howard cemetery on British Cemetery Road. Follow instructions on right to enlarge. Lightened of her fleshly load. She is gathered unto God. Since Ann Howard's birth month and day are not recorded we may justly wonder if the year of her birth (1724) is correct. Record keeping in colonial America, especially on Ocracoke Island, could not have been thorough or reliably accurate. Besides, Ann's husband George, according to his marker, was born in 1749. It is, of course, possible that Ann was 25 years older than George, but unlikely. Nevertheless, it is worth mentioning that the stonecutter was instructed to include the notation "Aged 117 years" to alert future generations that the dates (1724-1841) were not an error. Clearly, Ann Howard's surviving descendants believed her to be 117 years old. According to Bee Wilson's article "The oldest person on record remains the Frenchwoman Jeanne Calment, who died in 1997 aged 122." Ann Howard's grave marker is clearly visible from the road. It is on the left. If accurate, she "must have been the oldest person ever to have lived in North Carolina," as Carl Goerch writes in his 1956 book Ocracoke. 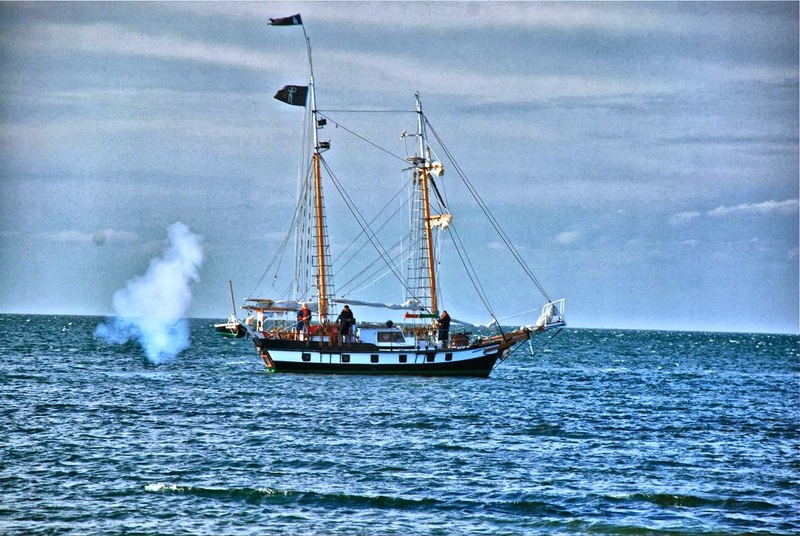 Saturday brought pirate crews, musicians, craftspeople, ships, blazing cannons, and mugs of rum to Ocracoke's waterfront as the Meka II under the command of Captain Sinbad, and the Ada Mae under command of Captain Ben Bunn engaged defenders on shore in a mock battle in Silver Lake. In the afternoon Lt. Robert Maynard won the victory when Blackbeard lost his head. I hope you enjoy these photos I took yesterday when Ocracoke was invaded by pyrates. Look for more pictures in the next day or so. For many years Ocracoke Island has been a magnet for artists, musicians and writers. 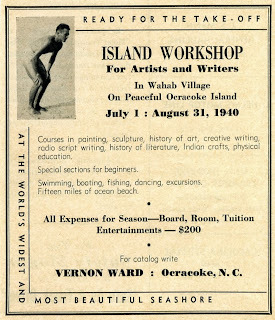 In 2008 I published an Ocracoke Newsletter about an early attempt to create what islanders referred to as an "Artists Colony" in the village. 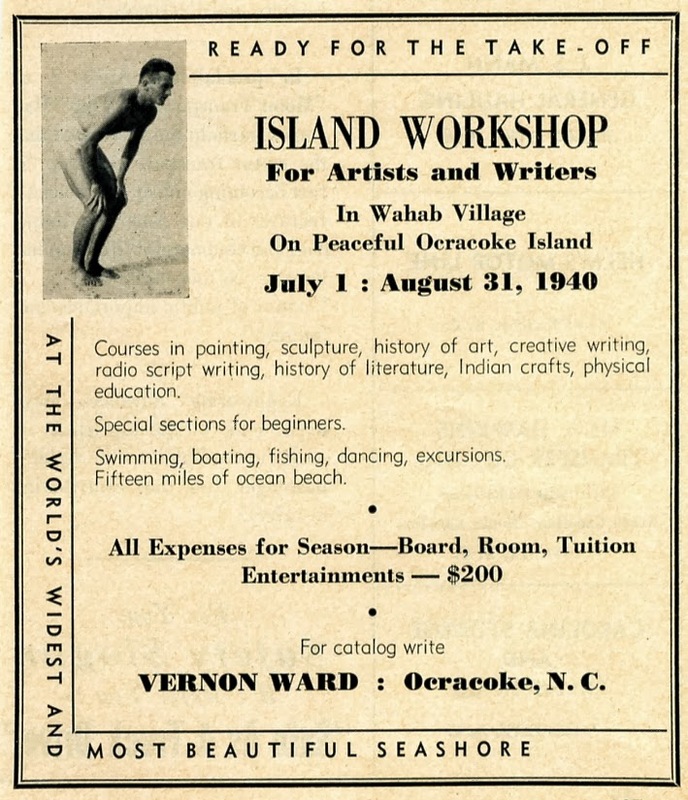 In 1940 and 1941 a small group of creative folks arrived on Ocracoke to participate in the "Island Workshop For Artists and Writers." 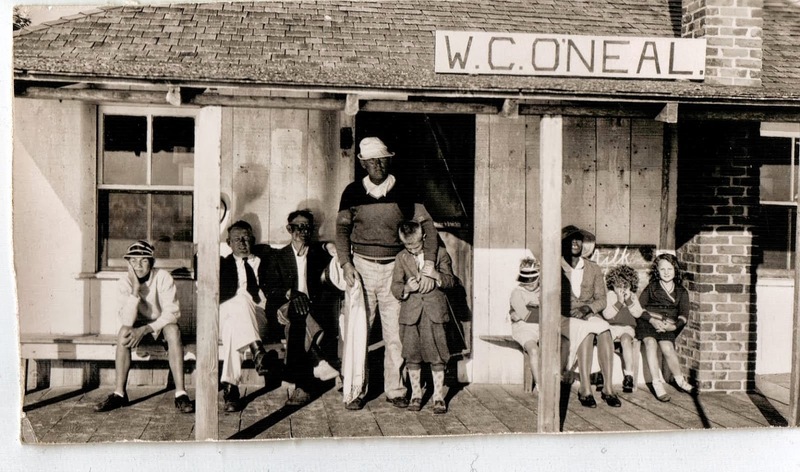 Because of World War II and its impact on Ocracoke the Workshop was not resumed in 1942.
http://www.villagecraftsmen.com/news112908.htm. This is a fascinating chapter of island history. Visitors to Ocracoke (especially those who are not boaters) may wonder why the ferries keep the red buoys on the left (or port) side when leaving Hatteras, then keep them on the right (or starboard) side when approaching the basin at Ocracoke. The saying "Red to the Right when Returning" applies. 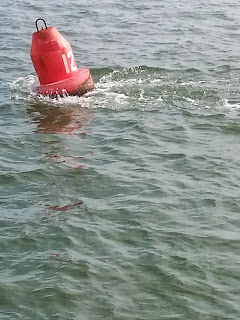 Red markers should be kept to the right "when returning from sea." Thus, as a vessel is approaching either Hatteras or Ocracoke "as if it were returning from the Atlantic Ocean" (regardless of where it actually came from), the red "nun buoys" should be on the right, and the green "can buoys" should be on the left. Conversely, when a vessel is in the channel heading towards the ocean (even if it does not intend to pass through the inlet), red should be on the left, and green on the right. Here is another photo from the collection of Mary Ruth Dickson. 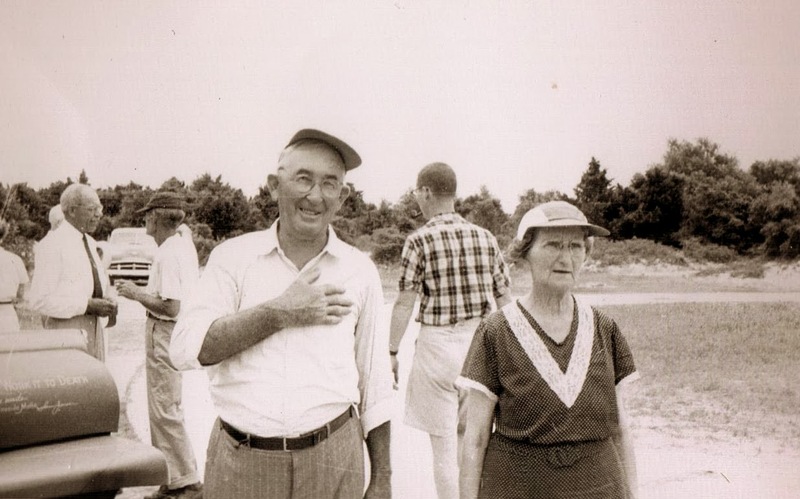 This is Murray and Elsie Wyche Tolson, taken during the annual July 4th Pony Penning in the mid-1950s. Cousin Elsie, as we always called her, was a sweet, good-natured woman. She had one sister, Martha (Cousin Mott), and one brother, Major General Ira Thomas Wyche (Cousin Ira). Cousin Elsie and Cousin Mott stayed on the island, but Cousin Ira studied on the mainland, then went to West Point. He served with honor and distinction in World War II. You can read his story here: http://www.villagecraftsmen.com/news092110.htm. The US National Park Service has installed informative signs along the Hammock Hills Nature Trail. Over the years I have read them, but recently I paid more attention. 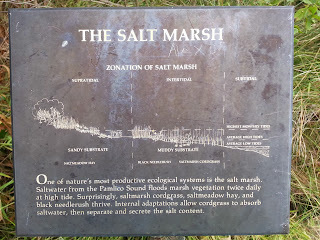 That's when I noticed the phrase "Zonation of Salt Marsh." Zonation?, I thought. It sounds like a made up word. 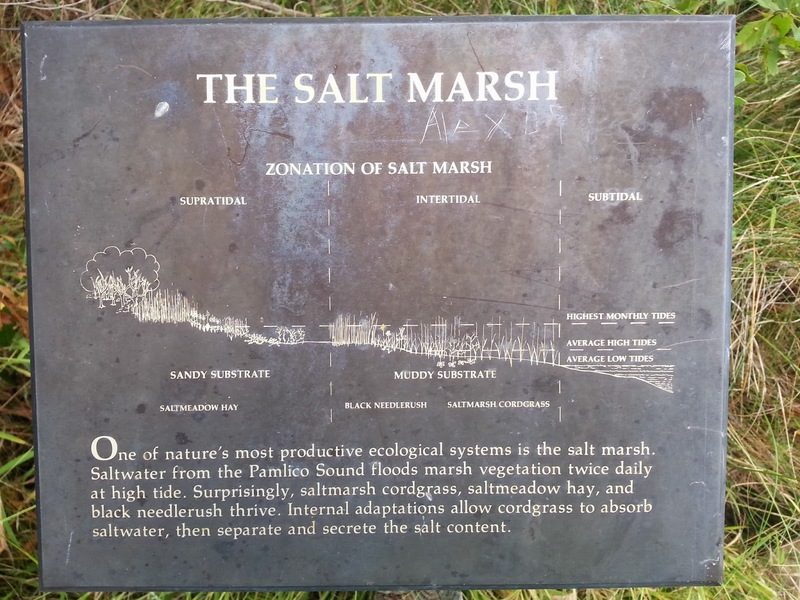 Wouldn't "Zones of the Salt Marsh" be more elegant? It turns out that "zonation" is listed in several on-line dictionaries, and even in my Merriam-Webster's Collegiate Dictionary. Not surprisingly, it means "structure or arrangement in zones." One feature that makes the salt marsh so dynamic is the zonation! Saltmeadow hay, black needlethrush, and saltmarsh cordgrass thrive in the supratidal & intertidal zones (both above the subtidal zone which starts from the average low tide line and extends into the sound). Fishermen, kayakers, clammers, and other adventurous folks know that Pamlico Sound offers numerous opportunities to enjoy unparallelled beauty and tranquility at Ocracoke Island near the marsh, an area teeming with life, and vital to the health of our coastal waters. 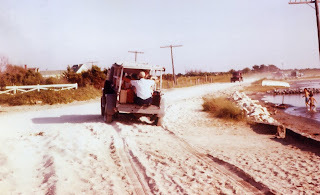 This month's Ocracoke Newsletter is the story of the Soundfront Inn. Built in the early 19th century, shortly after the lighthouse, the Inn is one of the oldest buildings on the island. You can read the article here: http://www.villagecraftsmen.com/news102113.htm. On Friday I posted this photo of Mr. Walter O'Neal's store. Several people have asked me to identify the people in the picture. From left to right they are: Russell Henley (I am thinking he was a friend of the Sam Jones family), Sam Jones (Norfolk industrialist and entrepreneur who married an island native and built Berkley Castle, Berkley Manor, and other prominent Ocracoke buildings in the 1950s), Homer Howard (my grandfather), Walter C. O'Neal, Sr. (store owner), William Jones, Howard Jones, May (last name unknown, employee of Sam Jones...or possibly island native Mildred Bryant), Charles Jones, and Mary Ruth Jones. William, Howard, Charles, and Mary Ruth are Sam Jones' children. Our most recent Ocracoke Newsletter is a compilation of humorous stories told by or about islanders. You can read it here: http://www.villagecraftsmen.com/news092113.htm. A medium size live oak is growing in my back yard. 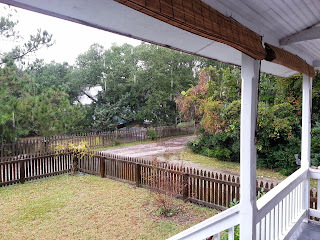 It's canopy spreads out over my outbuilding. 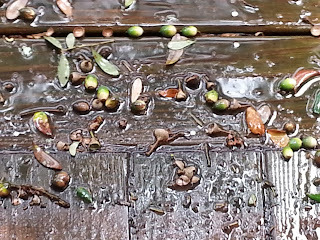 For the last few weeks this oak has been dropping acorns, many of which land on my steps. This photo was taken last Wednesday during the rain. "Oh yes, we almost forgot the one acorn question you really wanted to know the answer to: Only 1 acorn in 10,000 will grow up to be an Oak tree." I am careful when I walk down my back steps. 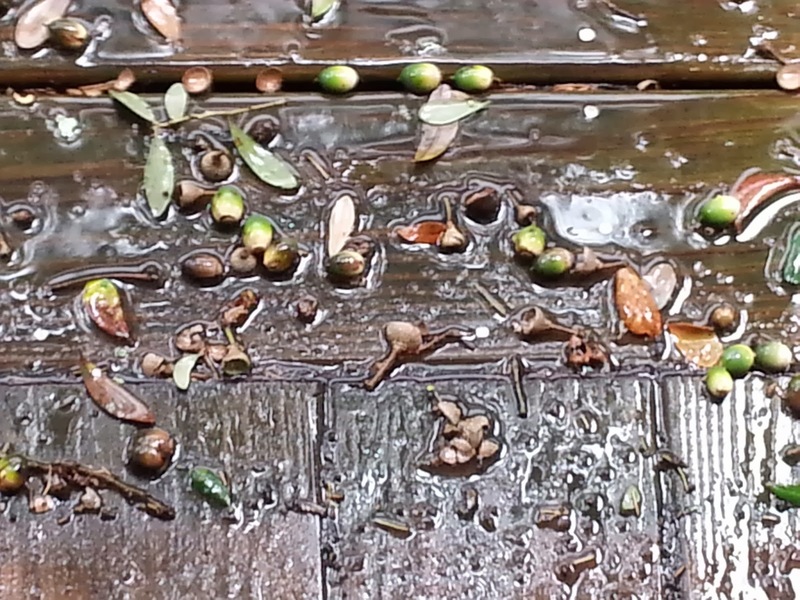 Acorns under feet can act like ball bearings, sending you on a merciless, rib-crunching slide. My father used to tell me that when he was a boy (he was born in 1911) Walter O'Neal had a store near the harbor. In addition to the usual staples, he had livestock, including a dairy cow...so he sold fresh milk and occasionally cuts of beef. More interesting to a young boy was ice cream, a rare treat on Ocracoke before refrigeration. Every now and then Mr. Walter would hand churn ice cream. Then he would raise a flag to announce his product to the village. I never asked my dad what shape or color the flag was. Maybe Blanche knows. I'll try to remember to ask her the next time I pay her a visit. Last week my cousin Becky and her family were visiting the island. Becky was born in the old kitchen that stood behind my house (it deteriorated and collapsed in the 1960s). Her visit reminded me of my summers on Ocracoke in the 1940s, before my grandparents had running water or a bathroom in the house. 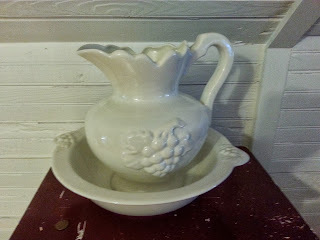 Each bedroom had a washstand with a pitcher and a bowl. We bathed (only on Saturday night!) in a galvanized wash tub in the detached kitchen, and used the outhouse or chamber pots. 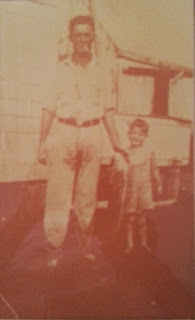 I often wonder what my grandmama would think if she could come back to visit her house today -- now fitted out with running hot & cold water, two indoor bathrooms, central heat and air conditioning, a washing machine, and Internet access. When I was a small child my grandmother's "old kitchen" was still standing behind the house. Many island homes from the nineteenth century had kitchens that were separated from the main house. 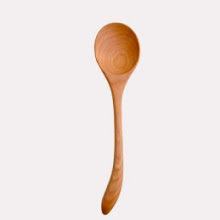 This helped keep the house from getting too hot when the wood stove was fired up...and made it possible to contain an accidental fire in the kitchen without burning the house down. 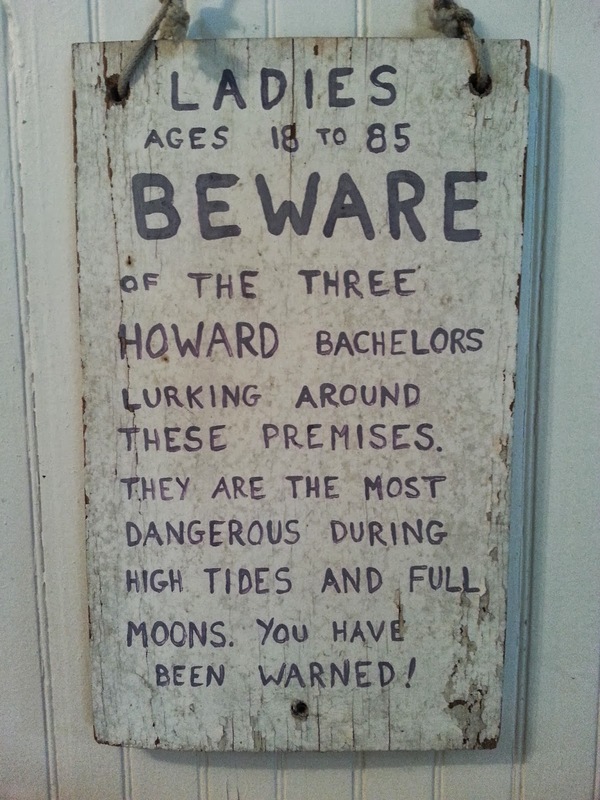 The sign was made by my daughter's boyfriend who enjoyed teasing me (I was divorced), my father (a widower who liked to get hugs from ladies after lying to them that it was his birthday), and my son (a handsome young true bachelor). We all lived on Howard Street. Marty hung the sign in the tree late one evening. It stayed up there for several years, and became a popular curiosity. I removed the sign some years ago because I was sure a college student would eventually come along and decide it would be a unique conversation piece for his dorm room. Besides, Lou Ann and I have been together for more than a decade, my father died in 2002, and my son has been married almost 20 years. It was time to take it down. The sign now rests in my spare bedroom. One hundred years from now the sign may elicit wild speculation about its origin...unless this blog survives, or my children remember to tell their children the story. 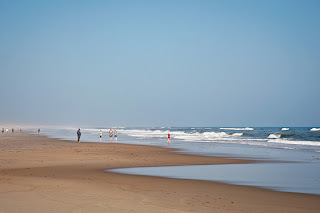 Our off-island readers often tell me that this blog helps them feel connected to Ocracoke. They remember fun family vacations here, and enjoy seeing vintage photographs that remind them of simpler times. Readers like to think of Ocracoke as an idyllic island community of friendly natives; an unspoiled beach where they frolic in clear, warm water; a town known for great music, quality shops, and excellent restaurants; and a village surrounded by opportunities for fishing, kayaking, and other water sports. Ocracoke, of course, is all of the above...but it's not perfect. Every once in a while (not very often, mind you) I think of something less than wonderful about my island home but I seldom share those thoughts in this blog...but I will today! The other day I poured Lachlan a glass of one of my favorite drinks, cream soda. I set the half empty bottle on my kitchen counter. The next day I decided to have the left over soda with my lunch. I knew it would not be fizzy, but that was OK. I put ice in a glass and poured the soft drink. Out came a big old water bug. It was very disgusting, and I was so glad I hadn't drunk directly from the bottle! Now, aren't you happy I didn't post a photo? Water bugs can be a nuisance anywhere in the south, and Orcacoke is no exception. I have been fairly successful in combating these pests with borax. I sprinkle it under the steps, near the outside doors, and behind the kitchen appliances. As a result I have remarkably few water bugs in my house, but it seems impossible to entirely eradicate them all. So, if you rent a cottage or a motel room on the island and find an occasional water bug, please know that the proprietors are not neglecting their sanitation routines. Even the cleanest and best of island homes is invaded now and then. If you are nimble and fast you can probably stomp on most water bugs you see scampering across your floor. And they really look more disgusting than they probably are. Below are three photos to give you an idea of what to expect if you are on the island for the upcoming Pirate Jamboreee, October 25, 26, & 27. 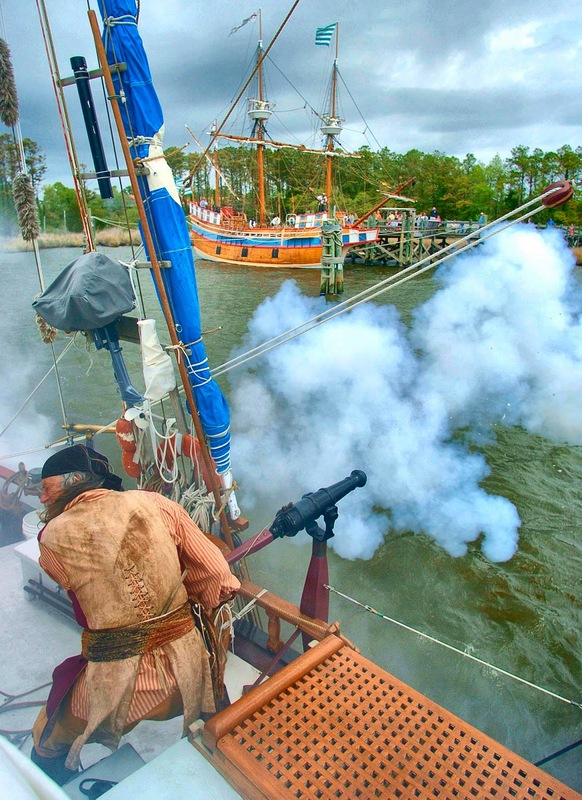 The Meka II, a Modern Day "Pirate Ship"
Meet the Pirates & Mock Trial of Blackbeard’s Crew! Halloween Carnival with Food, Games & Lots of Loot plus the Cake Walk and QUIZO! 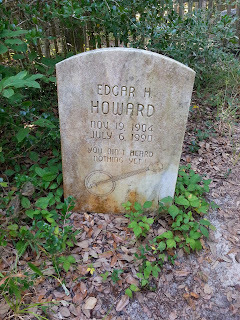 A reader recently asked about audio recordings of Edgar Howard's music and/or the distinctive Ocracoke Island dialect. Both are available. 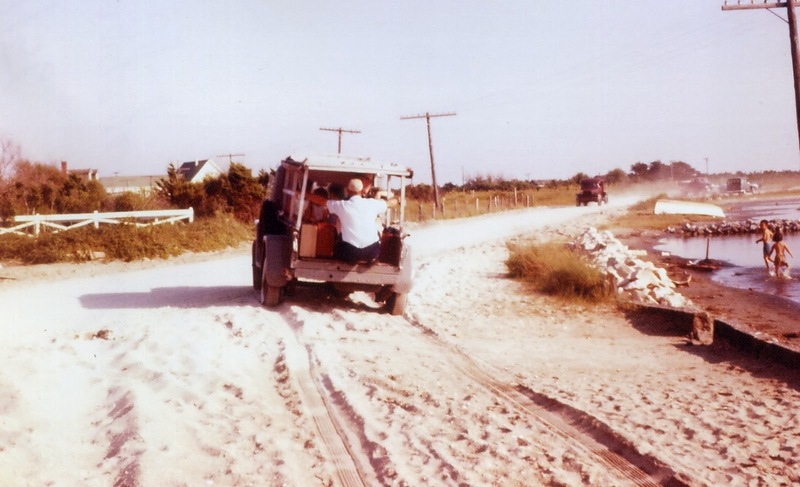 In 1977 Karen Helms collected sixteen examples of Outer Banks traditional music that were included on a vinyl record, Between the Sound and the Sea. This album was sold on the Smithsonian's "Folkways" label. Edgar plays his banjo on four numbers. Four other Ocracoke musicians, including my father Lawton Howard, are also featured. Between the Sound and the Sea is now available on CD and may be purchased here: http://www.folkways.si.edu/between-the-sound-and-the-sea-music-of-the-north-carolina-outer-banks/american-folk/music/album/smithsonian. You can also listen to selections of the songs on the web site. Yesterday I published a photo of Edgar Howard, celebrated island musician of the early 20th century. This is a picture of his tombstone that I mentioned. Edgar is buried on Howard Street, across from Village Craftsmen. His grave is just inside the white picket fence, near the single gate. 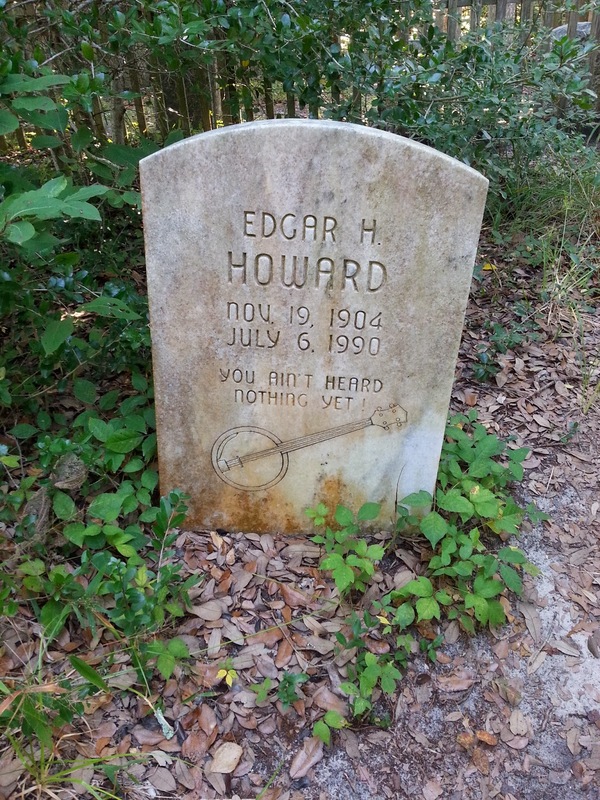 Edgar was not only an accomplished musician...he was an island character missed by all who knew him. Tomorrow look for links to some of his music. Long time visitors to the island, Art & Elizabeth, recently sent me a few photos from their 1981 Ocracoke Island wedding. 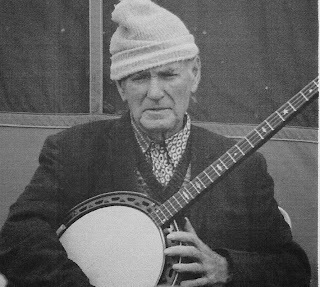 Edgar Howard played the banjo. They sent me this picture of Edgar sitting in front of their tent-camper. Edgar was born on the island in 1904. He died in 1990. Edgar's son, Ronnie Howard, started Howard's Pub. 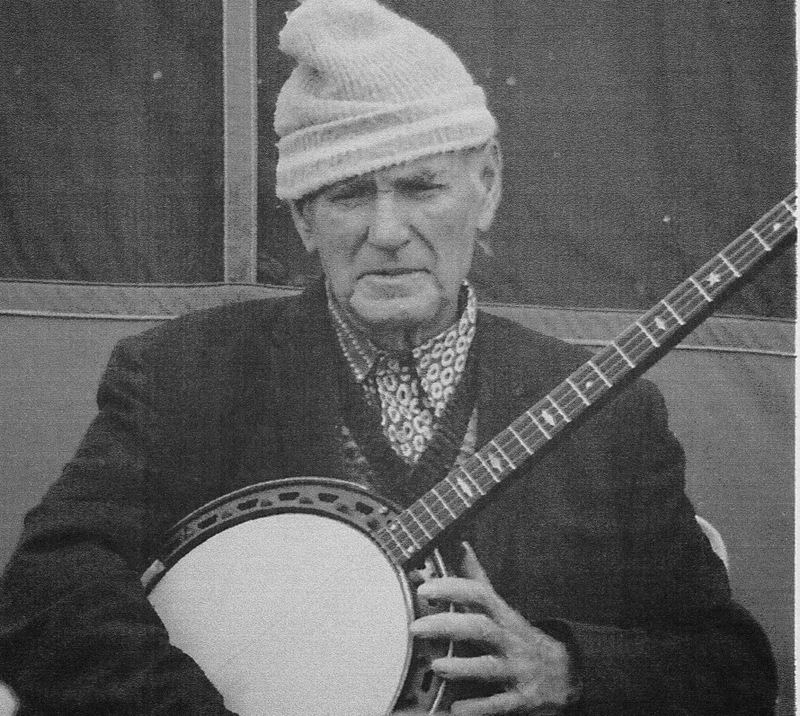 Edgar was an accomplished banjo player. Along with his brother Walter, who played guitar, they performed on stage in New York City and elsewhere in the 1920s and 1930s, often with stars such as Gene Autry, Al Jolson, and Cary Grant. 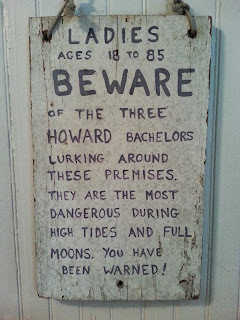 Look for an Ocracoke Newsletter about Edgar & Walter's jug band, The Five Harmaniacs, sometime this winter. Yesterday and the day before, it rained...and rained. The skies were gray and overcast, the wind picked up Tuesday night, and large puddles have accumulated around the village. I took this photo Wednesday morning from my pizer. 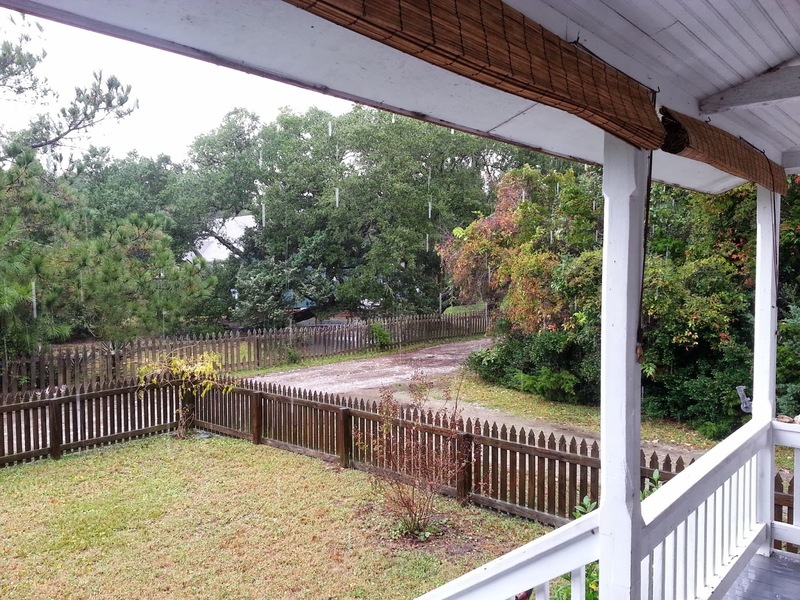 Even on a dreary day Ocracoke village is charming. 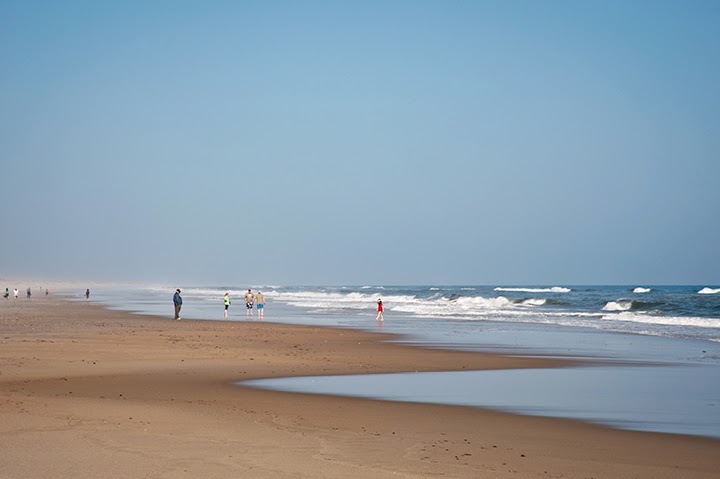 Dane Daniel, writer for the New York Times, had an article, "How the Shutdown is Affecting the Cape Hatteras Seashore" published on Monday. The article, about how the shutdown has impacted Ocracoke, is an accurate picture of the situation on the island. I thought our off-island readers, especially those planning a visit soon, would like to have this information. Daniel points out that, "in practice, enforcement has been flexible, at least for beachgoers on foot.... [L]ike dozens of beachgoers from states up and down the East Coast, judging from the cars in the parking lot, [a visitor from Greenville, NC] passed the small closure sign next to a dune walkover and spent a relaxing day at the beach." Island resident, Sundae Horn, adds, "officially the beach is closed, but...no one has been ticketed." You can read the entire article here: http://intransit.blogs.nytimes.com/2013/10/07/how-the-shutdown-is-affecting-cape-hatteras-seashore/?_r=0. 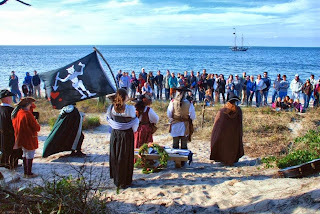 Blackbeard's Pirate Jamboree is scheduled for October 25, 26, & 27 right here on Ocracoke Island where Capt. Edward Teach was captured, killed, and beheaded in November, 1718. This free event, spearheaded by Daphne Bennink, co-owner of the Back Porch Restaurant, brings pirate reenactors and an historically authentic encampment to the island for a three day family friendly celebration of maritime and piratical history. Scheduled events include a pirate invasion, living history exhibits, tavern games, pirate skits, Skalawag School for kids, and more. If you live on the island, or nearby, mark your calendar now. This will be an exciting opportunity leading up to the 300th anniversary of Blackbeard's demise coming up in 2018! Hope to see you at the pirate encampment later this month. 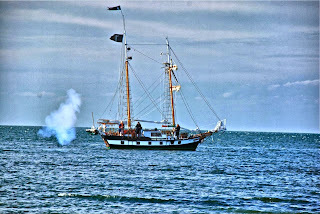 Click here to visit the Jamboree's Facebook page: https://www.facebook.com/pages/Ocracoke-Hattaras-Blackbeards-Pirate-Jamboree/186552064811019...and their web site: http://piratejamboree.com/. There is more information here and here. Make a batter of 2 eggs, 1/2 c. flour, 2 tbsp. corn meal, salt and pepper. Pour liquor off 1 pt. oysters and stir oysters into the batter. Drop by spoonfuls (2 or 3 oysters in a cluster) into deep fat and fry. If you can procure some Pamlico Sound oysters, you are in for a treat! 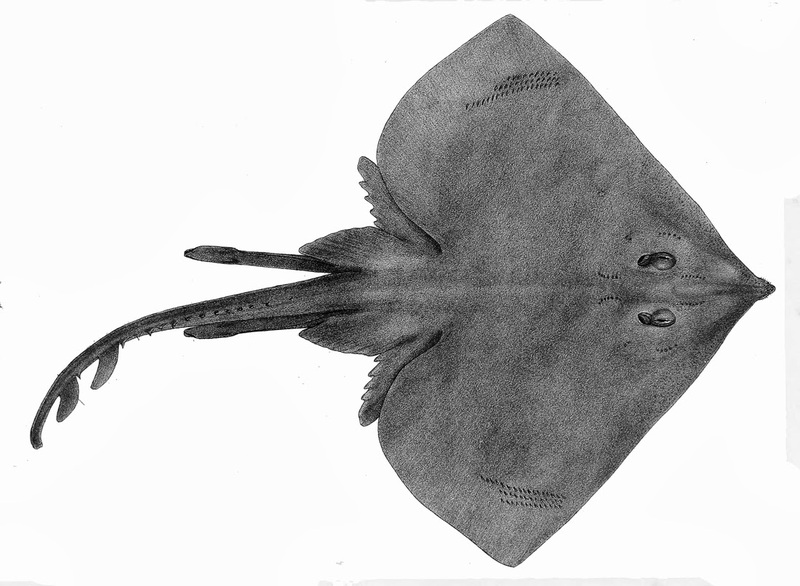 "The first time I got stung was the worst," Uriah recalled, "We were fishing down on the eastern end of the Legged Lumps [a shallow area in Pamlico Sound], and when the stingray stuck me he rammed it right through my heelstring and it came out the other side. He didn't leave it in me. Anyway, your Uncle William brought me home in the old Kingfisher. There was a doctor here for a while, and he took one of these small swabs and put Mercurochrome on it and pulled it through the hole on a string. Somebody gave me a fifth of liquor to kill the pain. He [the doctor] told me not to drink it, and he took the bottle and wouldn't let nobody in the room with me. Sometime later that evening after I woke up, he was there drunker than a bat. He had drinked all my liquor. I was laid up a month before I could walk." I was clamming in Pamlico Sound Thursday afternoon. It is not uncommon to encounter blue crabs, sea squirts, horseshoe crabs, or small fish. They are all interesting to come across, especially if I have children or first-time clammers with me. I am much less enthusiastic about encountering skates or rays. I know that skates are harmless, but rays can inflict a nasty sting...and I can never remember how to tell them apart. On Thursday, as I was pushing my rake, I disturbed a large flat fish which languidly flapped its "wings" and moved several feet away. I know that rays are not aggressive, so, even if it was a sting ray, I didn't expect it to attack me. But I was wary because it remained so close, and I didn't want to inadvertently step on it. "The Navy was so short of warships and trained crews to go after the German U-boats in the first months of the war, that they resorted to the use of local sailboats and small privately owned yachts. The rumor circulated that the submarines would surface and shoot the men on our boats with machine guns and small arms. True or not, the story made its point: the small local boats were certainly no match for the German U-boats. This fleet of small craft got the name Hooligan Fleet." Earl has photos of these vessels in his book. You can purchase the book at the Ocracoke Preservation Society. Shut Down? Not Ocracoke Village! In the wake of the federal government's partial shut down, our local on-line news source, the Ocracoke Current, has published two informative articles explaining what to expect locally...and how to enjoy your time on Ocracoke Island while our government figures out how to get back to business. A marker commemorating Beacon Island and Fort Ocracoke, a Civil War fort in Ocracoke Inlet, is located near the NPS Visitors Center, not far from Pamlico Sound. "The remnants of Fort Ocracoke are submerged in Ocracoke Inlet, 2 miles to the west-southwest. toward Portsmouth Island. The last of possibly four forts on Beacon Island, the mostly earthen Fort Ocracoke was constructed by mainland confederate volunteers, beginning on may 20, 1861, the day North Carolina seceded from the union and joined the confederacy. "After union victories on Hatteras Island in August, 1861, the confederates partly destroyed the fort and abandoned it without a fight. Mainland union forces completed the destruction in September, 1861. Beacon Island was consumed by the waters of Ocracoke Inlet in the first half of the 20th century. The fort's remains were discovered and identified by members of Surface Interval Diving in August, 1998, acting on a tip from Ocracoke charter boat captain, Donald Austin." On the other side of the marker are lists veterans from Ocracoke & Portsmouth who served in the Confederate and the Union armies. I recently read Charles C. Mann's book, 1491, New Revelations of the Americas Before Columbus. On page 372 Mann describes children's play in Santarem, a city in northern Brazil near the confluence of the Tapajos and Amazon rivers. "After [church] services," he writes, "whooping kids fill the red-dirt churchyard and fly kites. Sometimes they attach razor blades to the sides of the kites and in a war of all against all try to cut each other's strings." 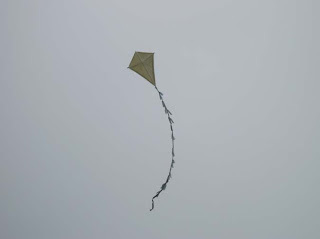 I remember my father telling me that, as a child on Ocracoke, he and his friends would attach sharp tin can lids to their kites, and have contests to see who could cut down the other kites. I don't know where it started, but I have learned that "kite wars" are traditional pastimes in India, Korea, and elsewhere in the United States, as well as in Brazil and Ocracoke.